Have a look at this picture for now. 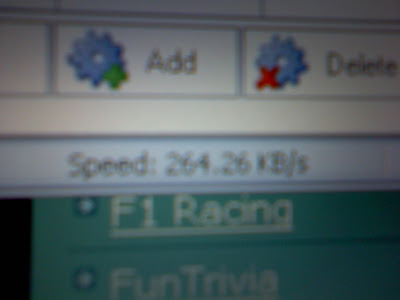 One fine day I was using Rapid Uploader to upload a video to rapidshare.I was using my dad's laptop.I connected it to my mobile phone to connect it to the internet.I was surprised to see the speed,it read 264.26 KB/s.Something was definitely wrong with Idea.I've never got the chance to use 2Mbps Dial-up after that day. Did it remain at that speed? I mean, data transfer rates can momentarily show incorrect values, and then stabilize later. Or it was incorrectly measuring throughout - happens in rare cases. I'm saying this because GPRS is technically incapable of doing 2 mbps speeds. @GQ-Right,it didn't remain at that speed.It was peaking occasionally and it really was downloading 260 KB files in a second.I just framed this post to look exciting to noobs. btw,Did you recognize the background?Looks familiar?